Pfc. Cornelius Cornelssen VIII, born July 25, 1925, in Manhattan and died Dec. 17, 2018, in Hoschton. A celebration of life is planned for noon Saturday, Dec. 29, in Flowery Branch. Updated: Dec. 24, 2018, 3:21 p.m.
That’s how Cornelius Cornelssen VII signed off on a brief telegram to his son, Cornelius VIII, who had just been wounded in Luxembourg during the Battle of the Bulge in the winter of 1945. “Hope wounds not serious mother and I are praying for you have courage,” read the telegram, now an artifact folded and faded in the possession of Cornelssen’s granddaughter, his son’s daughter. Pfc. Cornelius Cornelssen VIII — born July 25, 1925, in Manhattan and died Dec. 17, 2018, in Hoschton — had courage. He enlisted into the Army at 18 years old and was a heavy machine gunner in the 101st Infantry Regiment. He was awarded the Bronze Star for “exemplary conduct in ground combat against the armed enemy” during the Rhineland Campaign in early 1945. 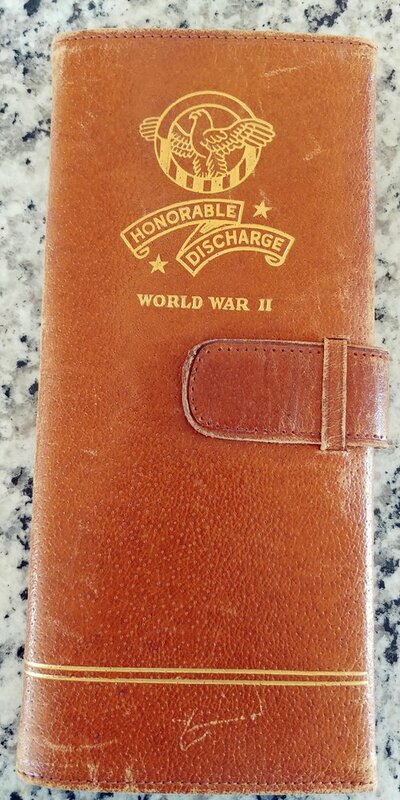 He earned two Purple Hearts for his war wounds in Luxembourg and Arracourt, in northern France. “He was shot in the calf and he fell to the ground,” his daughter, Candice Easton, told The Times on Christmas Eve about his fight in Luxembourg. “As he lay there and waited for medics, he saw somebody going around the field — a German picking off the wounded. He lay there and he played dead and hoped for the best, and he got bypassed. Pfc. 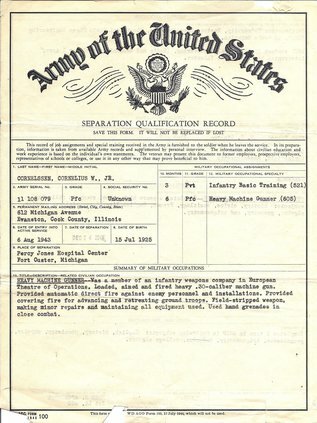 Cornelius Cornelssen's honorable discharge papers from the Army. Photo courtesy Candice Easton. 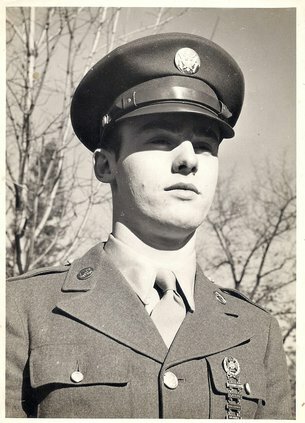 At the end of the war, Cornelssen would return to Pennsylvania, where he attended Drexel University in Philadelphia on the GI Bill to study engineering. He would also meet his wife, Jeanne Cornelssen, at Drexel before graduating and going on to create his own engineering firm in Camden, New Jersey, across the Delaware River from Philadelphia. He moved to North Georgia in the 1990s to be closer to his children. While living in the area, he attended the Brenau University Learning and Leisure Institute and enjoyed local theater. He lived independently until age 90, when an injury left him in the care of his daughter. For the past few years, he lived in the Oaks at Braselton because of his deteriorating health. 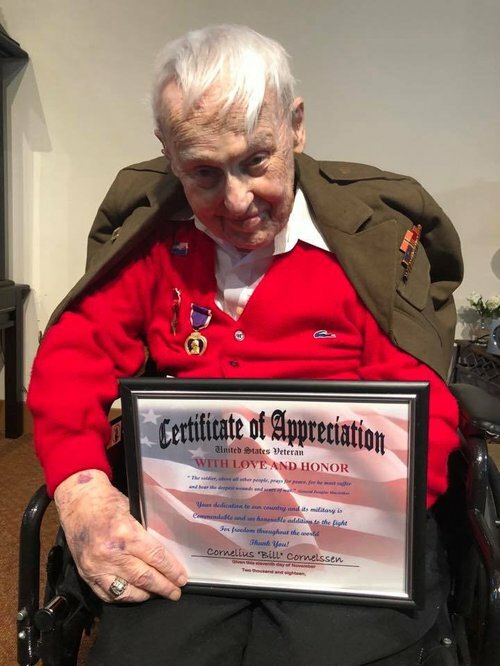 Now, 63 years after Cornelssen was brought to the ground by a rifle round halfway around the world, there’s almost no one left to bid farewell to the late soldier — a fate becoming more common for the longest-lived veterans of WWII. Cornelius Cornelssen. Photo courtesy Candice Easton. Cornelssen is survived by two children, a son in Hilton Head and his daughter in Hoschton. With her father already buried in the Georgia National Cemetery in Canton only two days after his death, Easton is trying to give him a celebration of life worthy of the man himself. Cornelssen’s celebration of life is set for noon on Saturday, Dec. 29, at the Flowery Branch Masonic Lodge on 5416 Spring Street. Easton invites local veterans to attend and celebrate her late father. More than 16 million Americans fought in World War II, and fewer than 500,000 are estimated to still live, according to the Department of Veterans Affairs. Like other soldiers who returned from Europe and the Pacific theaters, Cornelssen at first didn’t talk much about his time in the war. But later in his life, he opened up to his daughter. You can read Cornelssen’s obituary here. 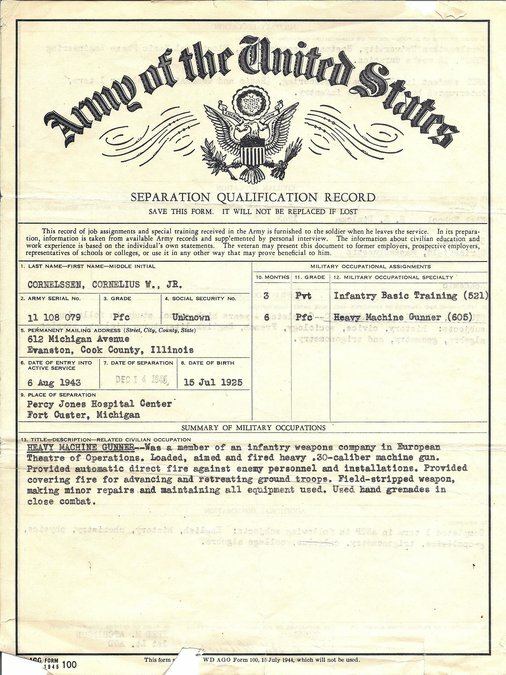 Cornelius Cornelssen's discharge papers show his experience and training during World War II.